The Family Table with Genevieve: All About Love....A fun link up! I am fighting some kind of bug and feeling a little worn down. But I can make it... vacation and sunshine are coming soon!! Although I do love candy, I really love fresh flowers. They brighten my day without tightening my pants. Hmmmm. I used to own a bakery, so you would assume I would answer baking. But maybe because I owned a bakery I am going to go with cooking. I love to cook...it is my favorite part of the day! Well there was one boy in the reading teepee in 2nd grade that kissed me on the cheek. Other than that I don't remember. I do remember my first kiss with Paul. It was after an outdoor Summer concert, in an alley, between two bars. Super romantic...right? No. They are too hard and taste like chalk. They do look super cute in a vase as a decoration though! No...maybe I should. I do leave little notes for my kiddos every so often, but not for Paul. But then again he is an engineer & not too into "fluff"
Yes. Just a few little pops of decor around our family room and kitchen. Pink. I will never forget when I started working for Target and found out I had to wear red...everyday. I did not own one red shirt. I never liked how I looked in red. I wore my red proudly for 10 years. Have not worn it much since... pink please! Dark Preferably with caramel or peanut butter. Attraction, yes. Love...not so much. I could watch How to Lose a Guy in Ten Days, Dirty Dancing and Pretty Woman over and over again. Stay in. I would rather enjoy a nice night in and cook a delicious meal than go out on Valentine's Day. But I love to go out too... just not on/for a holiday. 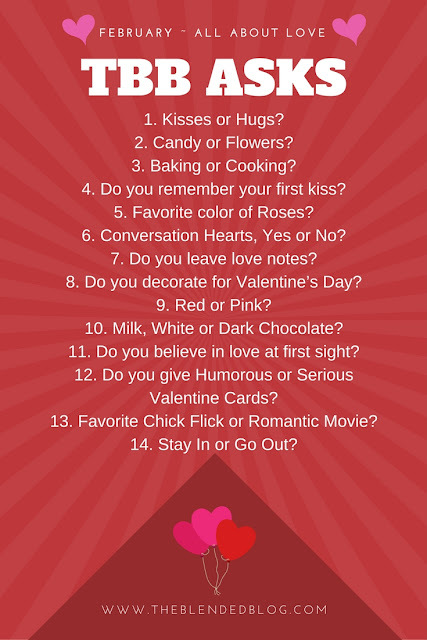 So there are some fun things about me and all things Valentine. Hope your coffee is strong and your Wednesday is short!